Saint Theophilus of the Kiev Caves, Far Caves and Archbishop of Novgorod, was chosen by lot after the death of the holy hierarch Jonah (November 5). He was elevated to the dignity of Archbishop of Novgorod on December 15, 1472 at Moscow. Until his elevation, he had pursued asceticism in the Otensk monastery. By tradition, when Saint Theophilus lay sick at the Chudov monastery, Saint Niphon of Novgorod (April 8), who is buried in the Kiev Caves of Saint Anthony, appeared to him in a dream. The saint reminded him of his promise to venerate the Kievan wonderworkers. 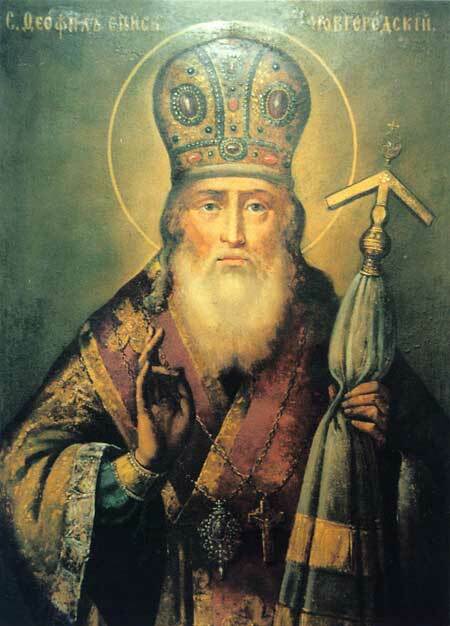 It is said that the holy archbishop went to Kiev, and just as he approached the Dniepr his sickness increased. He received a revelation that although he would not reach the Caves alive, his body would rest in them. This was fulfilled. His memory is celebrated also with the Synaxis of the Saints of the Kiev Far Caves on August 28, and on the Second Sunday of the Great Fast, with the Synaxis of the Kiev Caves Fathers. Правило веры, и образ кротости,/ и воздержания известный учитель Христову стаду воистину был еси,/ уча е выну смирению,/ не мудрствовати еже высокая,/ сего ради стяжал, яже желаше,/ отче святителю Феофиле,/ моли Христа Бога спастися душам нашим. Яко воистинну по имени своему ты,/ Боголюбезне святителю Феофиле и преподобне, соблюдши,/ явися тебе Христос Спас,/ обещая ти Живот и Царствие Свое,/ в немже, днесь ликуя, не забуди нас, рабов твоих.